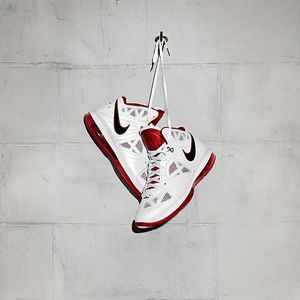 Lebron James is rocking the final edition of his Lebron 8 PS shoe from Nike for the playoffs. In the wake that there is news of his shoe not performing as well as Kobe's has of late, the rocking of a new pair for the playoffs that also debuted in stores on the say day the playoffs commenced is a way to help those sales. When the playoffs rolled around Michael had a new shoe but didn't it always seem like you couldn't get them until a few days after he rocked them first? MJ would tease us by breaking them out in a all star game first. Another factor about the third and final edition is they are anywhere from 1.4 to 2.4 ounces lighter. Good, maybe when you pick them up if you so choose, you may not feel like your wearing boots.